Theophrastus of Eresus was Aristotle's pupil and successor as head of the Peripatetic School. He is best known as the author of the amusing Characters and two ground-breaking works in botany, but his writings extend over the entire range of Hellenistic philosophic studies. Volume 5 of Rutgers University Studies in Classical Humanities focuses on his scientific work. The volume contains new editions of two brief scientific essays-On Fish and Afeteoro/o^y-accompanied by translations and commentary. 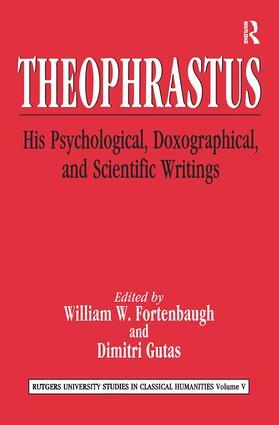 Among the contributions are: "Peripatetic Dialectic in the De sensibus," Han Baltussen; "Empedocles" Theory of Vision and Theophrastus' De sensibus," David N. Sedley; "Theophrastus on the Intellect," Daniel Devereux; "Theophrastus and Aristotle on Animal Intelligence," Eve Browning Cole; "Physikai doxai and Problemata physika from Aristotle to Agtius (and Beyond)," Jap Mansfield; "Xenophanes or Theophrastus? An Aetian Doxographicum on the Sun," David Runia; "Place1 in Context: On Theophrastus, Fr. 21 and 22 Wimmer," Keimpe Algra; "The Meteorology of Theophrastus in Syriac and Arabic Translation," Hans Daiber; "Theophrastus' Meteorology, Aristotle and Posidonius," Ian G. Kidd; "The Authorship and Sources of the Peri Semeion Ascribed to Theophrastus," Patrick Cronin; "Theophrastus, On Fish" Robert W. Sharpies.